If you are traveling independently in Iceland and have the time to spare, there is no better way to appreciate the beauty and tranquility of the country’s varied landscapes than by foot. When you take the time to get out of the car (or bus) and see the world without the filter of auto glass shielding you, nature assaults you with its sounds, sights and smells all working together. Besides, as a favorite Chicago band of ours, Poi Dog Pondering, sings: “You get to know things better when they go by slow.” At Take a Hike Photography, you could pretty much guess this is our theme song and motto! Iceland has so many different topographical features to explore that you cannot possibly exhaust the list of trails in a single trip. Even so, we did our best to put some kilometers on our hiking boots. Here are a few of our favorite treks. If you are looking to test your stamina and really get out there, then a multi-day trek through the heart of Iceland’s central highlands may be just what your looking for. the Laugavegur trek is a 4-day world-class hike that is listed among the classic treks of the world. It has several features that make it worthy of recommendation. Check out this fun trailer we made for a quick preview of what the hike is all about. First, it is accessible by public transportation to and from Reykjavík. The buses actually ford glacial-fed rivers to get you to the starting point, and the scenery along the route is worth the price of admission! Second, you have the option of either backpacking your gear and camping in a tent at designated campgrounds or staying in mountain huts with dorm-style bunk beds, a common room and loads of hiker camaraderie, reservable in advance through one of Iceland’s hiking clubs, Ferðafélag Íslands. If you prefer greater shelter from the elements—wind, rain and cold— then this is a great option, but you must plan well in advance. Third, you can extend your journey from 4 to 6 days by adding on the extension that takes you up and over Eyjafjallajökull, the volcano that famously erupted in 2010 disrupting European air travel. Regardless of your choice of length or accommodation, you will be treated to endlessly changing scenery and panoramic views of Iceland’s stunning beauty. As an added bonus, you will have to ford four bone-chilling, glacial run-off streams, at least one of which will feel like a real accomplishment once you make it across safely. Worry not: there is a cold beer or a shot of Icelandic alcohol at the end to warm you up. If your idea of a good day trip is a short 3 km hike through a beautiful valley with a relaxing reward at the end, then Hveragerði is a great destination. Located 45 kilometers east of Reykjavík, the ride to the nearby town hints at the focal point as you pass through rhyolite cliffs with steam pouring out of the rocks. This is one of Iceland’s hottest geothermal sources and the source of much of the country’s greenhouse agriculture. The hike itself is a pleasant uphill stroll following a warm river to its source, where it comes bubbling out of the earth at a boil. The bonus is that you can take a dip in this naturally heated stream wherever you feel like. The challenge is finding just the right temperature to soothe those aching calves and feet. We felt like Goldilocks as we tested out several pools until we found one that was “just right!” So if a hike with a built-in hot pool for relaxation is your thing, check out the geothermal paradise of Hveragerði. On the West Coast you will find this delightful, short hike that skirts the low cliffs from Hellnar to Arnastapi. If Mt. Snæfellsnes is in view, you may get a glimpse of its snow-covered peak. Along the way you will be treated to views over the ocean where you may even spot whales swimming by. Birds abound as you are treated to a symphony of birds calling and waves crashing. For photographers, the rock formations and the seaweed covered green stones offer plenty of subjects to explore through the camera. This is a great morning or evening, half-day hike if you are in the area. Located in the great Vatnajökull National Park that dominates the southeast corner of Iceland, Skaftafellsheiði is a full-day hike that will take you past waterfalls and mountain meadows, sweeping views of a glaciated valley heading toward the ocean and finally to a jaw-dropping view of the Skaftafellsjökull. A challenging but do-able 14-kilometer long hike, the views never disappoint. If you hike the trail in clockwise fashion, you will be rewarded with views of the glacier to your left as you descend for the last several kilometers of the trail. As a way of appreciating the sheer vastness of a glacier, consider this hike a must-do as you are making your way around the Ring Road. This geothermal region has a number of short trails worth exploring. We spent three days in the area hiking and photographing and were pleased by the variety of scenes. Lake Mývatn itself is a birding destination with several short trails that will get you access to the birds and the water and allow you to see some of Iceland’s wildflowers as well. The Krafla lava fields and the Hverir geothermal mudpots offer an otherworldly landscape. As a full day hike, we recommend the hike up to the Hverfell Volcano, where you can take a snack break on the rim and gaze out over Lake Mývatn. Next you descend through the strange rock formations of the Dimmuborgir where you may run into trolls. There is a cafe at the far end where you can break for lunch. The return trip is via the same route, though you can bypass the volcano and save yourself a repeat of the vertical climb. At the far end is the Mývatn Nature Bath where you can soak your weary bones after a long day of trekking. Considered by many Icelanders to be their “most scenic” spot, Ásbyrgi, with its horseshoe-shaped canyon and trees (yes, trees!) larger than 3 feet high, is the starting point of a 2 day, 33 km trek that follows the x river as it heads toward the dramatic waterfalls of Dettifoss and Selfoss. 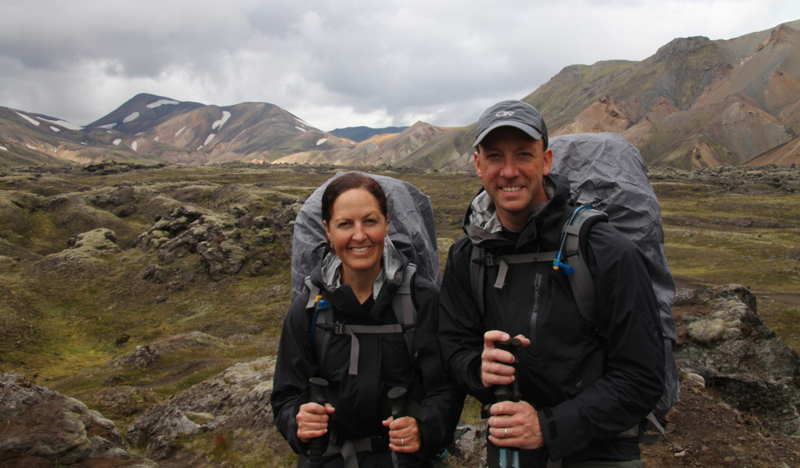 This hike was a great warm up for the Laugavegur Trek and has two features going for it. First, you can drop your car at the end and take a shuttle bus for a small fee to the start of the trek. Second, there is a campground about halfway that allows you to conveniently break up the journey (and they even accept, in fact prefer, credit cards!). Along the way, you are treated to stunning rock formations and many picturesque waterfalls as you follow the course of the river. There is one calf-deep stream to ford with characteristically chilly waters. Iceland has numerous smaller hikes in the northwest along the fjords and in the difficult-to-reach Hornstrandir, and in the northeast as well. We attempted one day hike near Borgarfjörður Eystri on a cold, rainy and foggy day to Stórurð. It was too wet for our cameras but we would certainly recommend it. We left Iceland knowing that we will return to do more hiking in the Land of Fire and Ice. Iceland looks like a photographer’s dream. You’ve got that right! If you are into photography, be sure to put Iceland on your short list of places to go. You’ll love it! I’ve been on the typical tour of Iceland i.e. on the roads round the island without seeing much of the interior. As a result I saw some of the locations in this post but also missed out on a lot in the centre -so it looks tempting to go back. As an aside I noticed the slow shutter speed photos – did you take a tripod on your hikes or was there some improvisation involved? Going back to Iceland to do the Laugavegur alone would be worth the return trip. We did have tripods with us in Iceland, but we didn’t carry them on most of the hikes. The one exception was the Dettifoss hike where it was very handy for the waterfalls. We wish we had them on the other hikes because there were so many beautiful shots to be had. Next time ! Hey, Ashley! Good to hear from you! You definitely need to get back to Iceland in the summer, but we are dying to go in the winter, too, to check out the Northern Lights. Did you get a chance to see them while you were there?